Wedding planning is now in full swing and I could not be more excited. We have been to two wedding fairs and seen a potential venue. We have a date in mind and the church is available so once we have seen two other potential venues we will make our decision and get our date confirmed and booked ! How exciting. I didn't actually expect that you would need to book so far in advance however, after to speaking to two venues they already have lots of summer 2018 booked up ! It worried us a little so we have decided to get it sorted asap. Then I can move on to all the fun things like decorations, cake, flowers and of course the dress. As I cant actually sort any of that out yet I have been going pinterest crazy and getting very inspired to choose my colours and theme for the day. I thought I would share with you a little wish list of things that Im really loving at the moment. As you can see there is a lot of pink and gold but this doesn't mean they would be my chosen colours! 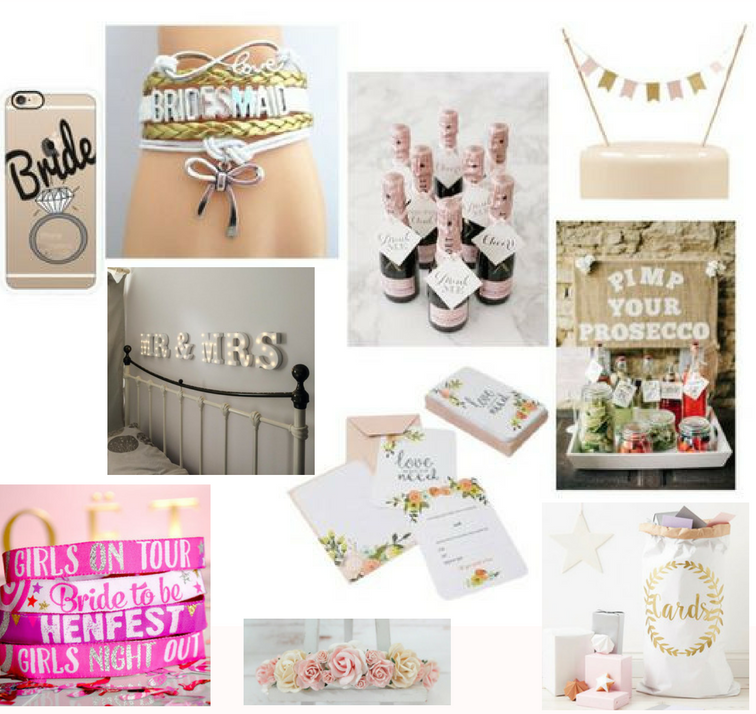 We both really love the 'pimp my prosecco' idea as it looks really quirky and I have never seen it at a wedding before. Me and my Maid of honour keep sending each other so many images of things that have bride or bridesmaid embellished on them, I'm hoping to own as much merch as possible. I love those little festival style bands that would be perfect for a hen weekend, a cute little keep sake too. I am also loving the Mr & Mrs lights as they would look fab at the wedding itself and then can be used at home once the wedding is over ! I also now have my 'actual' wedding ring as I have been waiting for it to arrive from being re-sized since I arrived back home. I am so in love with it and keep staring at it on a daily basis. Have I gone mad ? Check out my Pinterest board full of ideas ! How did you start planning for your wedding ?